We have seen initiatives using everything from sidewalk slabs to city buses, that attempt to create citywide WiFi networks. 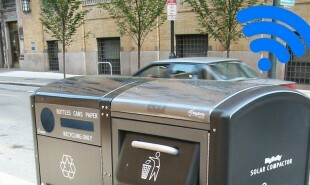 Now, in New York, a waste management company called Bigbelly is piloting another solution by using smart trash containers which could collectively create widespread municipal WiFi. BigBelly’s solar-powered garbage containers and recycling units are already fitted with Qualcomm chips, which automatically inform management when the bins are full — or smelly — via text or email. Now, BigBelly are hoping to persuade municipalities to deploy their WiFi enabled bins across their cities to provide continuous internet coverage. Since the bins are at street level, they would not be confronted with interference from the city’s tall buildings, and could also be used to display public service announcements and emergency alerts, on top of collecting valuable data for governments. What other existing smart structures could be used to enhance connectivity?